Catalpa Grove Cemetery Map Nw corner of NE ¼ section 21, township 31, range 13 near the post offices of Catalpa and Richmond. Farmers Hill Cemetery - NEW!! Also Known as Joy Cemetery Map 10 (11) miles north and one and ½ miles east of O'Neill, Nebr. The Postoffice of Joy had a post office, black smith shop, and general store. After 1914 became known as Blackbird. (Miniola) Map 423638N 0982710W Located northwest quarter of northwest quarter of section two township 30 range 10. Original started 1886. The city of Mineola was located 6 miles northeast of Opportunity or 7 miles from Niobrara. 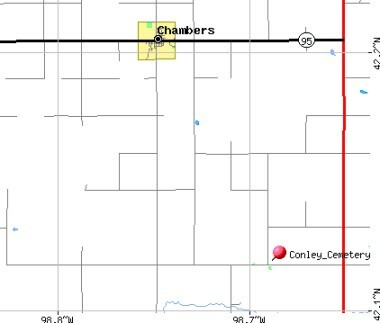 *Transcription in the Holt County ALHN Project Map North of Pump and Pantry in O�Neill on Highway 281, about .5 miles. On the west side of the highway. West edge of cemetery is bordered by Highway 281. South edge of cemetery is bordered by W Adams Street. N Jefferson Street runs north and south right through the middle of the cemetery. Protestants are usually buried between N Jefferson and N Madison. The older graves are in the northern half. The graves were first marked with wooden crosses, but they all burned in a prairie fire. So only iron and cement markers survived. That leaves areas between stones that look empty. Map Go south of Atkinson on Highway 11, 27 miles or to the substation, 472 avenue and 849 road turn west 4 miles to 468 avenue and 849 road. Map These two cemeteries are located in Holt County, Nebraska. They are about 14 miles north of O'Neill, then about 1 miles east. There are two cemeteries on this road about ¼ mile apart, Paddock and Pleasant Valley. This small plot is on private land. You will need to get permission from the owner before visiting. This small cemetery is on a hill over looking the Niobrara River. Go straight north of O'Neill, till just about a mile from the river, turn west and follow the road, at the house, go into the pasture and in one of the small grove of trees is this cemetery. Check both Stuart Community Cemetery and St. Boniface Cemetery for your names. Map 1874-1902 located north of Atkinson, along the highway to Butte. Wooden Shoe Cemetery Map Holt most of the graves were moved to Atkinson later. Located on Fred Jansen's land, two miles east and five miles north of Atkinson. Surrounded by lilac bushes.